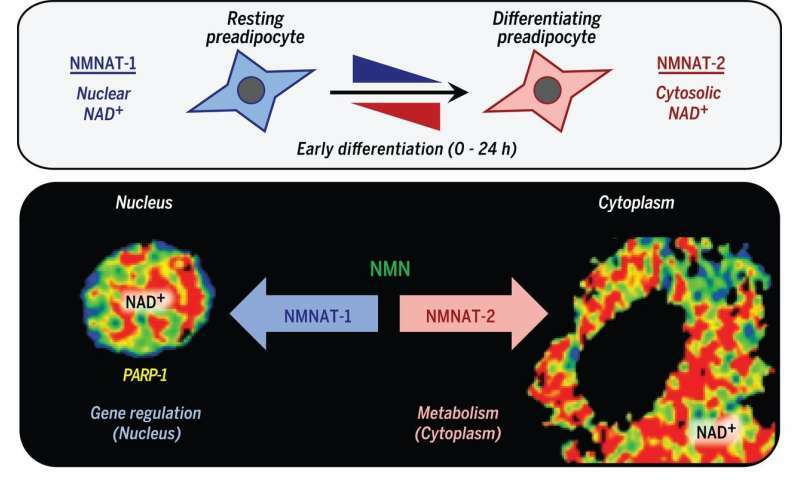 A team of researchers at the University of Texas has found NAD+ synthesis and consumption integrate glucose metabolism and adipogenic transcription during adipocyte differentiation. In their paper published in the journal Science, the group describes their research into how glucose is converted into fat in the body and what they found. Sophie Trefely and Kathryn Wellen with the University of Pennsylvania and Drexel University, respectively, offer a Perspective piece on the work done by the team in Texas in the same journal issue. As obesity rates continue to climb around the globe, scientists continue to explore why it is happening. In addition to studying the psychological aspects involved, scientists would also like to better understand why eating too much makes people gain weight. In this new effort, the researchers looked more closely into why consuming too much glucose causes the body to produce fat. Prior research has shown that nicotinamide adenine dinucleotide (NAD) is an important molecule that plays a role in a wide variety of physiological and pathological processes. Its oxidized form, NAD+, has also been found to act as a cofactor in metabolic pathways, and more importantly, perhaps, is consumed by various enzymes. Once consumed, NAD+ is broken down into nicotinamides and ADP-ribose. This, the researchers note, means that NAD+ must be resynthesized for normal cellular function to continue. They further note that some prior research has suggested that lower-than-normal levels of NAD+ can alter metabolism, leading in some cases to higher disease susceptibility. The researchers believed that cellular metabolism and gene regulation might be connected to the synthesis of NAD+, so they embarked on a series of experiments to back up their ideas. In so doing, they discovered evidence indicating that compartmentalized (within membrane-bound organelles) NAD+ synthesis and subsequent consumption served to integrate glucose metabolism and adipogenic transcription as part of the adipocyte differentiation process. The study results, Trefely and Wellen note, show that metabolism involving membrane-bound organelles is distinct from that involving small molecules such as NAD+, which can pass through nuclear pores, allowing metabolic equilibrium.